Your company runs Windows Server 2008. The company network is configured as an Active Directory domain named contoso.com. The network has a Web server named WEB1. The domain users access WEB1 by using http://web1. You generate a self-signed certificate for WEB1 and configure WEB1 to use SSL. Users report that they get a warning message when they connect to WEB1 by using https://web1. You need to ensure that users can connect to WEB1 without receiving a warning message. What should you do? A. Add the https: //web1 name to the list of Trusted Sites zone on all the computers in the domain. B. Open the Certificates console on WEB1. Export the self-signed certificate to a web1.cer file. Install the web1.cer file on all the computers in the domain. C. Join WEB1 to the contoso.com domain. Request all the users to use https://web1.contoso.com to connect to WEB1. D. Create a DNS Host (A) Record for WEB1 in the contoso.com zone. Reissue the self- signed certificate. Request all the users to use https: //webl.contoso.com to connect to WEB1. To ensure that the users can connect to TK2.com without getting warning messages, you should export the self-signed certificate to a TK2.cer file. Then, you install the tk2.cer file on all computers accessing the website. The users account will be authenticated through the certificate and they will not get any warning messages. The .cer file is an internet security certificate extension which confirms the authenticity of a website installed on a server. Your company has an Active Directory domain. The company runs Remote Desktop Services. A user has remotely logged on to the Remote Desktop Session Host Server. The user requires help to use an application. When you connect to the Remote Desktop session, you cannot operate any applications. You need to ensure that you can assist any user on the Remote Desktop Session Host Server. What should you do? A. From the Remote Desktop Session Host Server run the Tscon /v command. Then reconnect to the session. B. Run the Chgusr /execute command on the Remote Desktop Session Host Server. 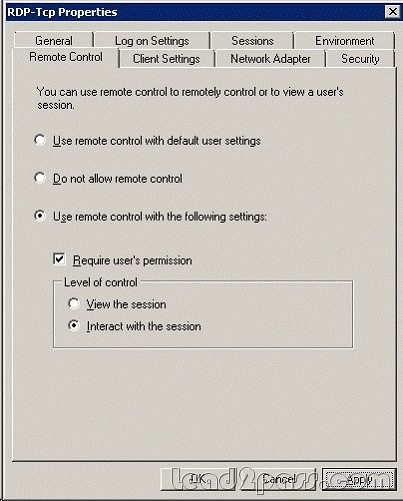 C. Enable Use remote control with default user settings in the RDP-Tcp Properties. D. Enable Use remote control with the following settings in the RDP-Tcp Properties. Configure the Level of control policy setting to Interact with the session. Instruct the user to log off and log back on. 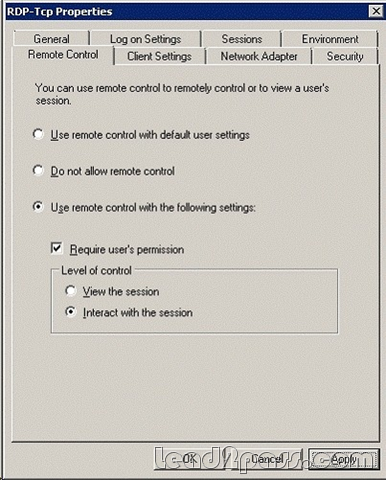 In Remote Desktop Session Host Configuration rightclick RDP-Tcp and choose properties. You have a server that runs Windows Server 2008 R2. The server has the Web Server (IIS) server role installed. The server contains a Web site that is configured to use only Windows Authentication. You have a security group named Group1 that contains several user accounts. You need to prevent the members of Group1 from accessing a Web site. You must not prevent other users from accessing the Web site. Which Web site feature should you configure? Add or Edit Allow Authorization Rule and Add or Edit Deny Authorization Rule Dialog Boxes Use the Add Allow Authorization Rule,the Edit Allow Authorization Rule, the Add Deny Authorization Rule, or the Edit Deny Authorization Rule dialog box to define rules for access to content. You install the Web Server (IIS) server role on a new server that runs Windows Server 2008 R2. You install a Microsoft .NET Framework 1.0 application on a Web site on the Web server. The company security policy states that all applications must run by using the minimum level of permission. You need to configure the Web site application so that it has the permissions to execute without creating any other content and without accessing any operating system components. What should you do? A. Set the .NET Framework trust level to Full for the Web site. B. Set the .NET Framework trust level to Low for the Web site. C. Set the .NET Framework trust level to High for the Web site. D. Set the .NET Framework trust level to Medium for the Web site. My Computer – The application code is hosted directly on the user’s computer. Local Intranet – The application code runs from a file share on the user’s intranet. Internet – The application code runs from the Internet. Trusted Sites – The application code runs from a Web site that is defined as "Trusted" in Internet Explorer. Untrusted Sites – The application code runs from a Web site that is defined as "Restricted" in Internet Explorer. You can set the security level for each zone to High, Medium, Medium-low, or Low. Your company named Contoso, Ltd. runs Windows Server 2008 R2. You manage a Web server named Server1. Internet users access Server1 by using http://www.contoso.com and https://www.contoso.com. The Server1 server uses an SSL certificate from a public certification authority (CA). You install an additional Web server named Server2. You configure a Network Load Balancing cluster to distribute the incoming HTTP and HTTPS traffic between both Web servers. You need to configure an SSL certificate on Server2 to support HTTPS connections. You must ensure that all users can connect to https://www.contoso.com without receiving security warnings. What should you do? A. Open the Internet Information Services (IIS) Manager console on Server2. Create a self- signed certificate. B. Open the Internet Information Services (IIS) Manager console on Server1. Export the SSL certificate to a .pfx file. Import the .pfx file to Server2. C. Open the Certificates snap-in on Server1. Export the SSL certificate to a .cer file. Import the .cer file to Server2. D. Request a new SSL certificate from the public CA. Use Server2 as the Common Name in the request. Install the new certificate on Server2. Start IIS Manager. Click Start, point to Administrative Tools, and then click Internet Information Services (IIS) Manager. In the console tree, click the name of the computer. In the IIS section of the center pane, double-click Server Certificates. Right-click the certificate (.cer file) in the center pane, and then click Export. Select the location for the exported file, type the name for the file (with the .pfx extension), and then type and confirm the password to encrypt the private key. You have two servers that run Windows Server 2008 R2 named Server1 and Server2. Both servers have the Windows Media Services server role installed. Server2 is a License Clearing House. You publish an audio file on Server1. The audio file is licensed by Server2. You need to ensure that users are allowed to use the audio file for only two days. What should you do? A. On Server1, modify the key ID. B. On Server1, modify the license key seed. C. On Server2, modify the license. D. On Server2, create a new package. Playing the file. To play the file, the user needs a player that supports Windows Media Rights Manager. Support for Windows Media Rights Manager was first added to Windows Media Player for Windows XP. Players that were created using the Windows Media Player ActiveX control version 8 or later also support this DRM platform. With the appropriate version of the Player installed, the customer can then play the file according to the rules or rights that are included in the license. Licenses can have different rights, such as start times and dates, duration, and counted operations. For instance, default rights may allow the user to play the file on a specific computer and copy the file to a portable device. Licenses, however, are not transferable. If a customer sends a protected file to a friend, this friend must acquire a different license to play the file. This per-computer licensing scheme ensures that the protected file can only be played by the computer that has been granted the license key for that file. You have two servers that run Windows Server 2008 named Server1 and Server2. Both servers have the Windows Server visualization role service installed. You need to remotely manage the visualization settings of Server2 from Server1. What should you do? A. From the command prompt, run vmconnect.exe server2. B. From the command prompt, run vmconnect.exe server1 server2. C. Open the Visualization Management Console. From the left-hand pane, right-click Server1, point to New and then click Virtual machine. D. Open the Virtualization Management Console. From the left-hand pane, right-click Virtualization Services and then click Connect to Server. You have a server that runs Windows Server 2008. The server has the Web Server (IIS) server role installed and all the Web Server role services installed. You need to provide a user the ability to administer a Web site. Which feature should you configure? You have a server that runs Windows Server 2008 R2. The server has the Hyper-V server role installed. You need to merge a differencing disk and a parent disk. What should you do? A. Edit the parent disk. B. Inspect the parent disk. C. Edit the differencing disk. D. Inspect the differencing disk. You have a server that runs Windows Server 2008. The server has the Windows Server virtualization role service installed. You create a new virtual machine and perform an installation of Windows Server 2008 on the virtual machine. You configure the virtual machine to use the physical network card of the host server. You notice that you are unable to access network resources from the virtual machine. You need to ensure that the virtual host can connect to the physical network. What should you do? A. On the host server, install the MS Loopback adapter. B. On the host server, enable the Multipath I/O feature. C. On the virtual machine, install the MS Loopback adapter. D. On the virtual machine, install Windows Server virtualization Guest Integration Components. If you want to pass Microsoft 70-643 successfully, donot missing to read latest lead2pass Microsoft 70-643 practice exams.